Anxiety self help starts with recognizing you have an issue with stress and anxiety. It might be that all you need is to practice some self care, and be aware of the damage anxiety can do when unchecked. When anxiety has gotten the better of you, the first place you will probably notice it is in your body. Your muscles are tense, your heart may pound, and you might be irritable and cranky. Sound familiar? The one thing you need to do most when you are already feeling physical symptoms of stress, is to relax. I know, easier said than done. But there are a few 5 minute techniques that can help your body to relax, so that your mind can shortly follow. I know, I know… everyone always says “take a deep breath”, right? Well they are right, and they are wrong. Yes, deep breathing scientifically lowers the level of stress hormones in the brain. However, although simple to do, it is more than just taking a deep breath. Here is a quick 5 minute deep breathing technique you can do almost anywhere to reset your stress control centers. Breathe out through the mouth to a count of 8. Thats it! Not only does the controlled breathing affect your brain chemicals, counting out the breath helps you “get out of your head” and get a better handle on whatever is stressing you. Flex your calves and thighs. Hold for the count of 10. Release. Flex your abdomen and chest. Hold for a count of 10. Release. Flex your back. Hold for a count of 10. Release. Flex your shoulders and arms. Hold for a count of 10. Release. Flex your hands into tight fists. Hold for a count of 10. Release. If you can do this without being obvious, flex the muscles in your face and neck. Hold for a count of 10. Release. If you can’t… (Ok, I dare you to scrunch up your face in your next office meeting!) then simply flex your jaw. Hold for a count of 10. Release. Last, flex your entire body at once. Hold for a count of 10. Release. Now, don’t you feel better? You just released all that physical stress, and signaled your mind to calm down too. Women & anxiety is a big subject in our household. I’ve suffered from anxiety all my life, and so have all my kids to some degree or another. But I think us ladies could use some support making it ok to take care of ourselves. Seriously, nothing will activate anxiety like allowing yourself to get overwhelmed. Yep, I get it. Kids, job, money, PTA… whatever it is, it can feel stressful to have so much on your plate. Women and anxiety is no joke. Take our over filled calendars, throw in some hormones and parenting stress, mix it up with a big spatula of self esteem issues, and you have a recipe for some really intense anxiety. Don’t let it get there. So first, learn to say, “I deserve some self care”. Repeat after me, ladies. Lecture over. Now use these 5 minute self care anxiety relief techniques to stop stress before it starts! Music. 5 Minutes of your favorite upbeat tunes can turn your whole day around. Try it! Can’t think of anything? Pull up whatever app you get your music from, and start with “What a Feeling” by Irene Cara. Exercise. I’m not talking running a marathon here guys, just 5 minutes of something. 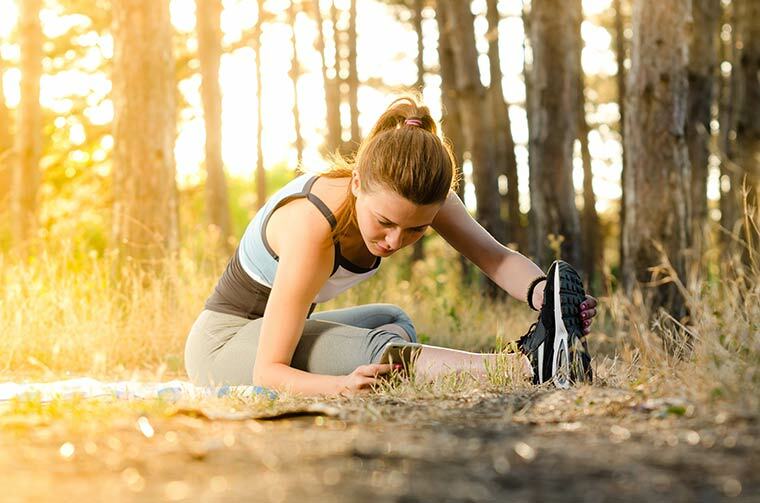 It’s a proven fact that exercise releases positive chemicals in the brain and helps to combat anxiety and depression. Even if you have to lock yourself in the bathroom with a two year old pounding on the door, you can run in place anywhere. Get up and move, just for 5! Read. Nothing works better for me when I’m feeling anxious than reading a bit of a good book. It’s not that the words themselves are fixing my anxiety, it’s simply giving my brain some time to think about something not related to my stresses. It’s a little vacation for your mind. No matter what your spiritual life is based upon, there is always a way to incorporate your beliefs into anxiety relief. Simply put, anxiety comes from negative self talk. In other words, we frankly don’t trust ourselves, and our minds tell us over and over again that if something terrible happens, we will not be able to deal with it. So trusting a higher power can go a long way in relieving anxiety. Find yourself a mantra “saying” that reflects your beliefs that you can repeat to yourself when your mind is trying to tell you anxiety lies. Five minute anxiety relief techniques, right? So try it for that amount of time. Then go one farther and say it to yourself for five minutes everyday, even when you aren’t stressed. Why? Because using a positive message to reprogram your negative thoughts, over time, will help you respond better to anxiety and stress. This is one of my favorite anxiety self help techniques. The power of nature to soothe our souls is scientifically documented. Walk outside, breathe fresh air and look at the clouds. Take a quick walk around the yard or up the street. Notice nature all around you. Or take a houseplant and give it some loving care. Wash it’s leaves, give it a good drink, trim back dying foliage. Nature is healing. This 5 minute anxiety coping skill takes a little more forethought, but in my experience is the most powerful one for long term, lasting change in your anxiety. Get yourself a pretty blank journal, and set your phone alarm for the same time every evening when you will have 5 minutes to yourself. Then for just five minutes, journal about your most anxious thought that day. Here’s how to do it. And what fear in me does this worry represent? What is the worse case scenario with this worry? How would I deal with that scenario? Write down a positive, present tense affirmation for yourself to deal with this fear. For example, “It’s taking courage for me to face this problem.” Or something more specific, but this gives you an idea of where to start. This anxiety reduction technique helps in a few ways. First of all, it forces you to face to the fear, but also to determine what it is you are really afraid of. (No one is really afraid of speaking in public, what you are afraid of is what people think of you when you speak in public.) Second, it allows you to realize that no matter what happens, you can handle it. Third, it allows you to create a scenario in your mind with a positive affirmation to retrain your negative self talk. 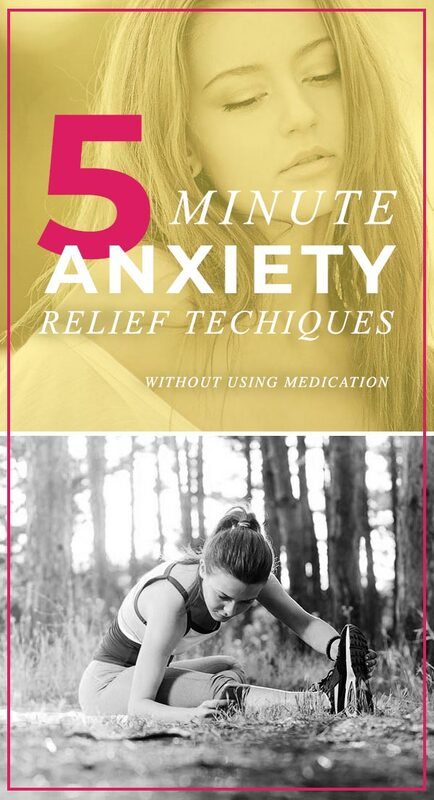 So give these 5 minutes anxiety relief techniques a shot and make them a part of every day. Previous Post Beauty Basics : Cleaning Makeup Brushes & Tools The Easy Way!